Small - $12.99 Only 9 left! Jyn Erso is trying to make the Empire have a pretty bad day in Rogue One: A Star Wars Story. But your child isn't having any of that! Nope, not one bit. And that's why he's asked you to outfit him as one of the most feared Stormtroopers to ever serve Darth Vader. A solider from the dreaded Death Trooper division! 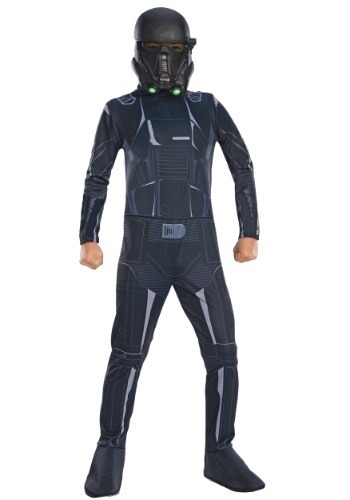 You probably don't have the foggiest idea how to get him equipped to help serve the Empire, but that's what this Rogue One Death Trooper costume for kids is for! Because it will transform any boy or girl into a fearsome warrior who's ready to help squash the Rebellion. The one piece jumpsuit isn't Imperial issued gear, but with printed costume effects, it looks pretty close to the real deal. Easy secure Velcro tabs and attached boot covers mean they'll be able to transform into this Star Wars villain with all-too-much ease. Just use the plastic mask to complete the devious effect, and you may want to equip them with a blaster toy to help them battle the Rebels (sold separately), or you could just arm them with a treat bag to help them wrangle all the trick-or-treat candy. Whichever mission is more pertinent!